The pointer combines athletic grace and power with a lean, muscular body, noble head, alert expression and noble carriage. The gait is smooth and powerful, with head held high and nostrils wide, enabling it to cover a lot of ground while searching for airborne scent. The tail lashes from side to side when the dog gaits. 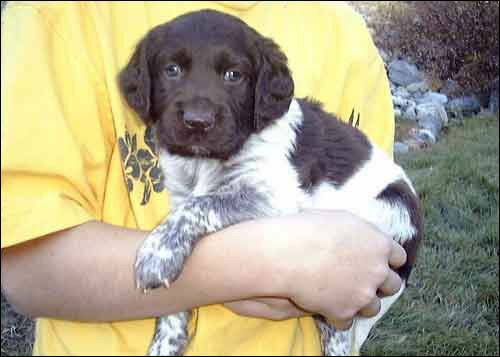 The pointer's close coat is short and dense, giving a clean streamlined appearance. field type pointers tend to hold their tails upright when on point. The pointer is a true wide-ranging hunter, which means that it not only is an excellent bird dog but also has the stamina to run for hours. Consequently, it needs lots of exercise or it can become frustrated and destructive. Because it is ever on the lookout for birds, it is easily distracted from everyday matters — but it is nearly impossible to distract once on point. It is gentle and sweet but may be too energetic and boisterous at times for very small children. Like many sporting breeds, it can be found in field or show types; the field type is generally smaller and perhaps more active.